Charles R. Hale Prod. 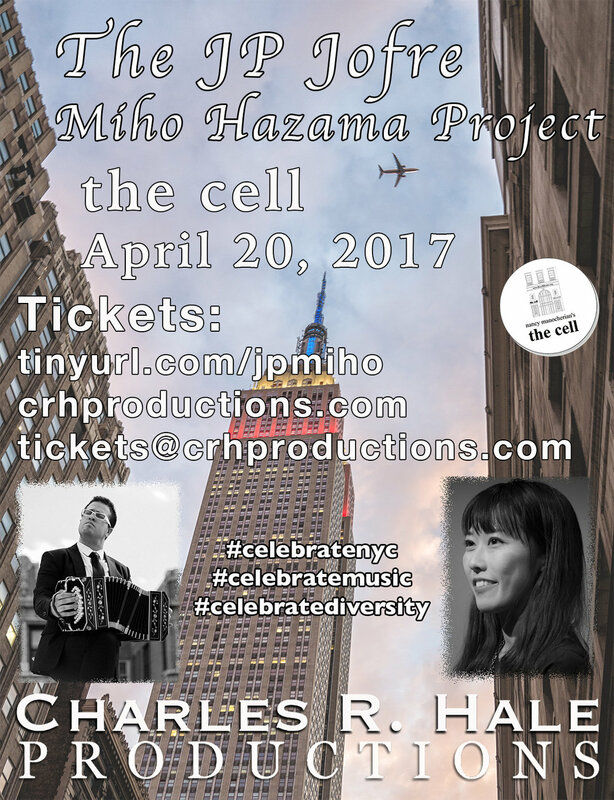 presents "The JP Jofre | Miho Hazama Project"
Charles R. Hale’s new six part series entitled “New Yorkers: Together in Story and Song” which will be presented at nancy manocherian’s the cell this summer and fall, was created in order to support a diverse and extremely talented collection of musicians from around the world. New York City has always been a melting pot and a mecca for aspiring artists. The arts, particularly music, are also a cultural melting pot and a vital component of human civilization, shared between cultures for millennia. “New Yorkers: Together in Story and Song” celebrates this great American melting pot by presenting artists form around the world including those from Europe, Asia, Africa, South America and the United States. For centuries, artists of all genre have contributed to making New York City one of the richest and most dynamic mosaics in the world. Simply stated, the overarching goal of Charles R. Hale’s series is to allow each artist the opportunity to reach their full potential and to become another shining tile in our great city’s mosaic. Allowing artists to realize their full potential can’t be done without your help. We may be facing cutbacks in the governments sponsorship of the arts, thus your support of the arts will provide the strength that will carry us through difficult times, foster artistic creativity and unite us all.